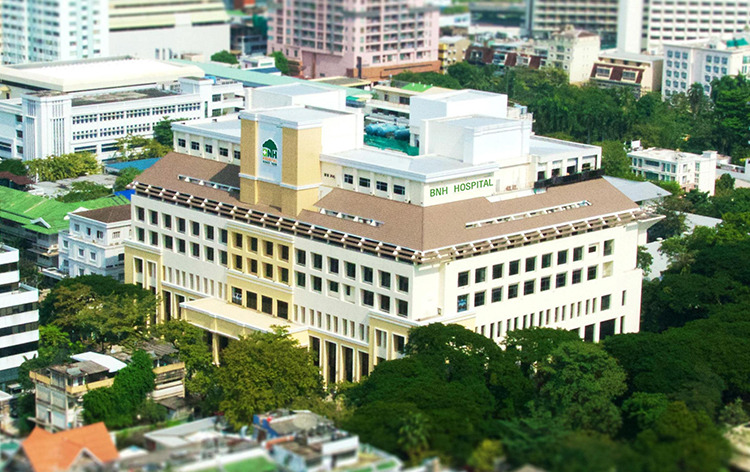 BNH Hospital is a highly reputed and recognized hospital of Thailand and holds pride in being recognized as the First International Private Hospital in the Kingdom of Siam (Thailand). The hospital is considered a pioneer in providing tertiary medical care for Women’s Health, a special center for Orthopedics & Spine surgery while boasting of being one of South Asia’s best reproductive care centers, Bangkok International Fertility Center. The 120 bedded healthcare facility houses great numbers of experienced and accomplished consulting doctors and specialists imparting exceptional medical services to all patients, domestic as well as international. Formerly known as Bangkok Nursing Home, the hospital was established more than 100 years ago by the British Ambassador to Thailand in 1898 as a nursing home to expatriates. Although the new BNH Complex set with the international standard for clinical care became operational from 1996. BNH is Thailand’s one of the oldest private hospitals and has a reputation of treating thousands of patients from over 150 countries. This world-class hospital is a magnet to international patients considering the outstanding medical services and primary to advanced treatments offered by the highly trained experts at an affordable price. The hospital has successfully provided treatment to international patients in the specialties including complex surgeries of Bone & Spine, Minimal Invasive Surgery, Fertility and International Travel Medicine. Nearest Airport: Suvarnabhumi International Airport which is 31 km from the hospital and can be reached via road through 30 min drive. Nearest BTS Sky Station: Sala Daeng BTS Station which is just walking distance away from the hospital. BNH Hospital performs 383 different procedures. Click on a procedure name to see more details and to view doctors for that specialty. 4.7 average based on 60 reviews.